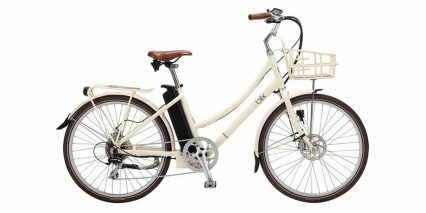 The Blix Sol is a simple but well-made cruiser electric bicycle with an affordable starting price. It ships without fenders, racks, or lights, but the company does produce and sell these as upgrades. You can see them in action on their city model, the Blix Aveny. Whether you buy the official accessories or not, the Sol does come with mounting points for fenders and racks, so they’re easy to upgrade later on your own. 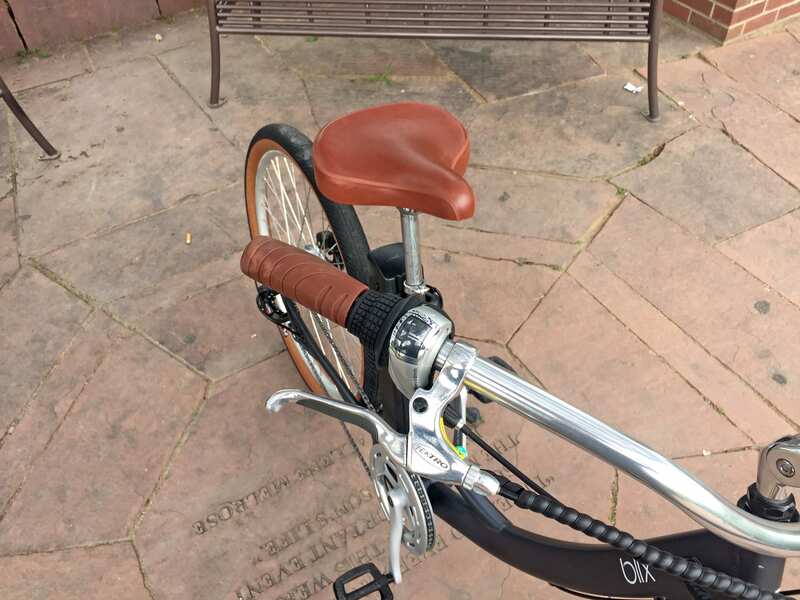 I did not see bosses for adding a water bottle or folding lock, perhaps they could be stowed in a trunk bag if you get the rack, and you could always get a handlebar-mounted cup holder like this because there’s so much space on the bars. 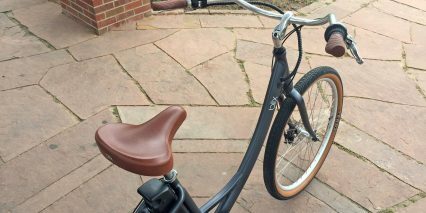 The handlebars on this bike are extra long and swept back which helps to dampen vibration and provide a relaxed upright body position. Even though the Sol does not ship with a suspension fork or suspension seat post, the ride feel is good. Rubberized ergonomic grips, an extra large saddle with rubber bumpers, and higher volume tires all contribute. While the frame only comes in one, the longer bars, adjustable height quill stem (that also swivels for adjustable angle), and extra-low downtube and seat tube height allow it to accommodate a wide range of body types. This would be a great choice for petite riders with hip and knee sensitivity, who can’t step over tall frames and don’t want the weight of larger products. 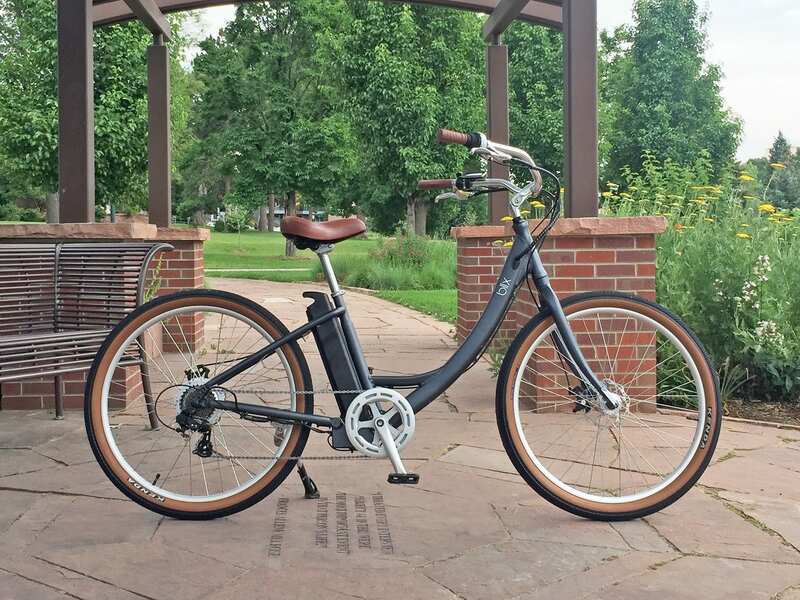 It can also fit larger people, in fact, while reviewing this model at a shop called Best Electric Bikes in Denver Colorado, I asked one of the employees to help me with test rides… and he’s 6’2″ tall! We didn’t raise the seat or anything, so he wasn’t getting the best leg extension during the ride test, but he also wasn’t hitting his knees on the handlebars or struggling to steer. 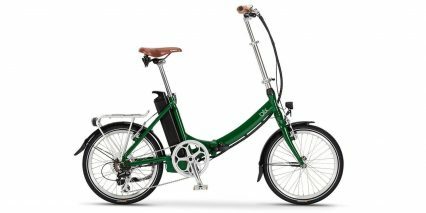 Blix is a Sweedish electric bike company that began in 2014. They offer a wide range of products including two folding models. 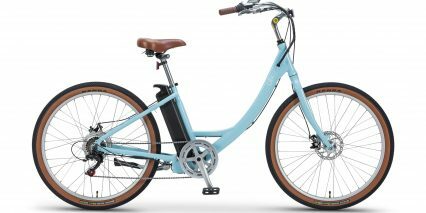 With the Sol model (which means sun in Sweedish), you get efficiency, beauty, and support from a growing network of shops that will assemble and support the product, with it’s two-year warranty for $1.6k which makes it pretty compelling and impressive to me. 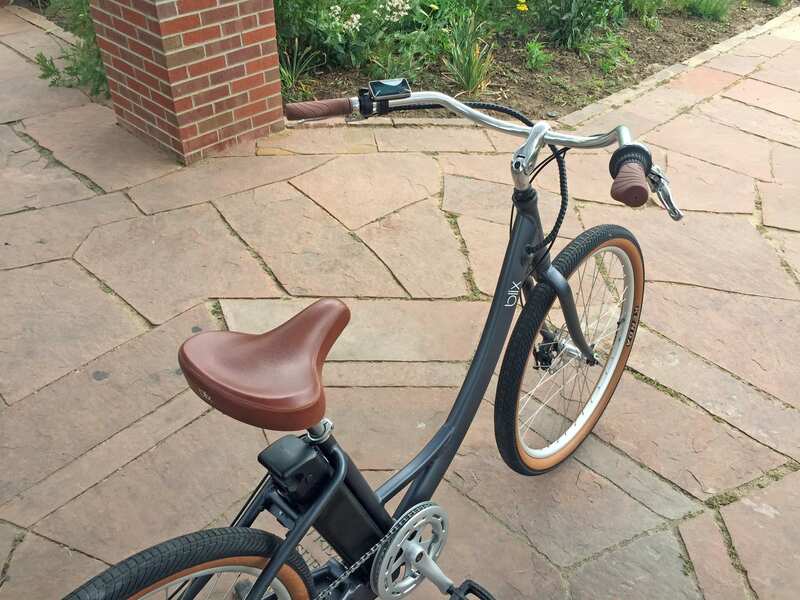 It’s not the most powerful e-cruiser, but the quiet and smooth pedal assist operation balances nicely with a zippy trigger throttle and seven speed drivetrain. The motor powering the Sol is called the R6 and is branded as SpinTech, which is unique to Blix. It’s a custom design that looks a little nicer and rides a little smoother than some of the Bafang, Dapu, and Shengyi solutions I’m used to seeing. The satin silver casing matches the other silver accents on the bike (rounded rims, crank arms, chain guide, seat post, stem, handlebar, and brake levers) and its compact size helps it to blend in on the rear wheel; hiding between the silver disc brake and seven speed Shimano cassette. The motor offers 350 to 500 watts of power and up to 60 newton meters of torque. It’s efficient and quiet but still zippy when using the throttle… The company founder, Pontus Malmberg, told me that they had programmed the motor controller for the Sol to be a bit peppier than some of their other bikes. 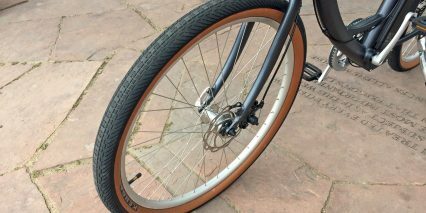 It has a similar 250 pound max rating, but uses thicker spokes and has reinforcement tubing and gussets to provide stiffness and strength. The demo bike that I rode for this review was the very first Blix Sol made available. 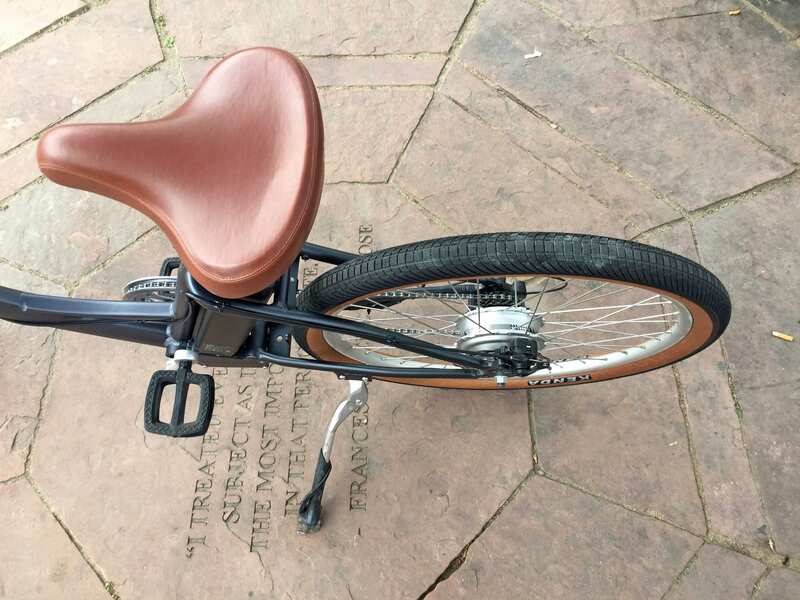 I had seen it while visiting Blix in Santa Cruz, California (where they are based) and got to ride it for the first time in Denver after it was shipped and re-assembled. I noticed that the motor power cable, which attaches to the right chain stay, was a bit long and bowed out vs. zip-tied close. This might have been unique to the demo model, but I’d definitely keep an eye on that to avoid snags and bends. 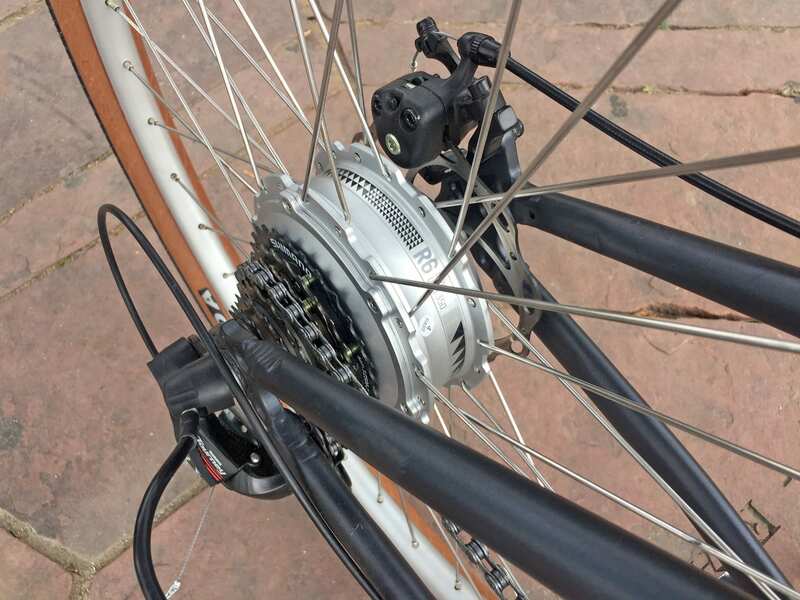 There’s a quick disconnect point in the motor cable, but no derailleur guard to add protection to this area of the bike. Thankfully, they’re pretty easy to find and install aftermarket. With an entry-level Shimano Tourney derailleur, you get durability with a bit of additional weight, limited gear range, and slightly slower shifting. It’s likely a cost savings decision by Blix and it works fine for a neighborhood model like the Sol. 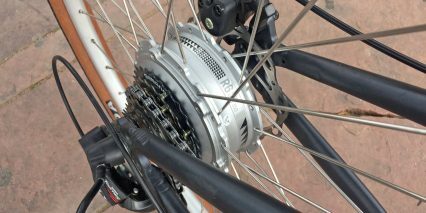 The one aesthetic compromise I found relating to the drive system is the controller box, positioned below the bottom bracket. By separating this from the battery, Blix may be reducing heat exposure and also keeping replacement battery packs more affordable. It only costs $200 to upgrade to the larger pack at time of purchase, and you can purchase additional 400 watt hour batteries for just $400 vs. $800 from Bosch or Yamaha (on competing products). 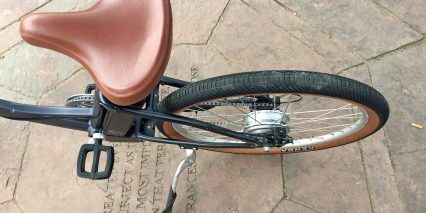 The battery pack is also branded as SpinTech and it looks great, mounted securely behind the seat tube. 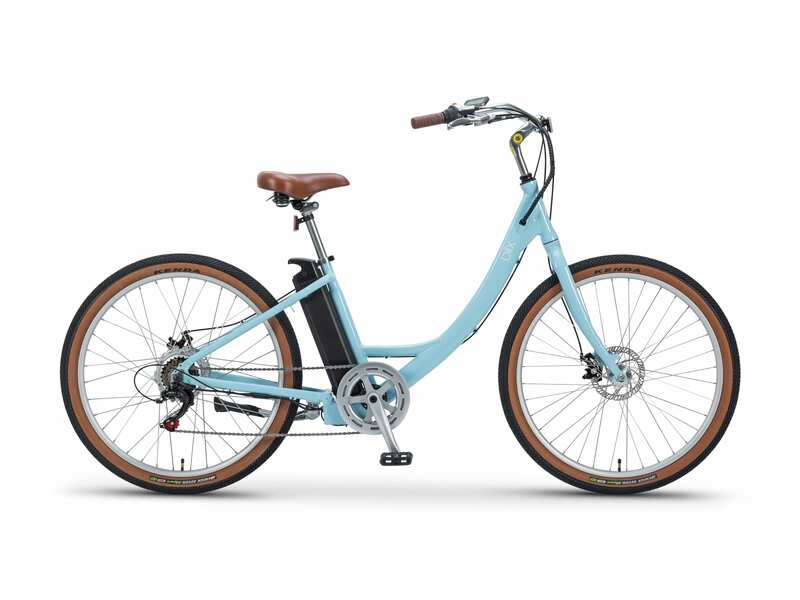 In this position, battery weight is kept low and center on the frame for optimal handling, and it won’t interfere with a rear rack and eat into the maximum rack weight load. 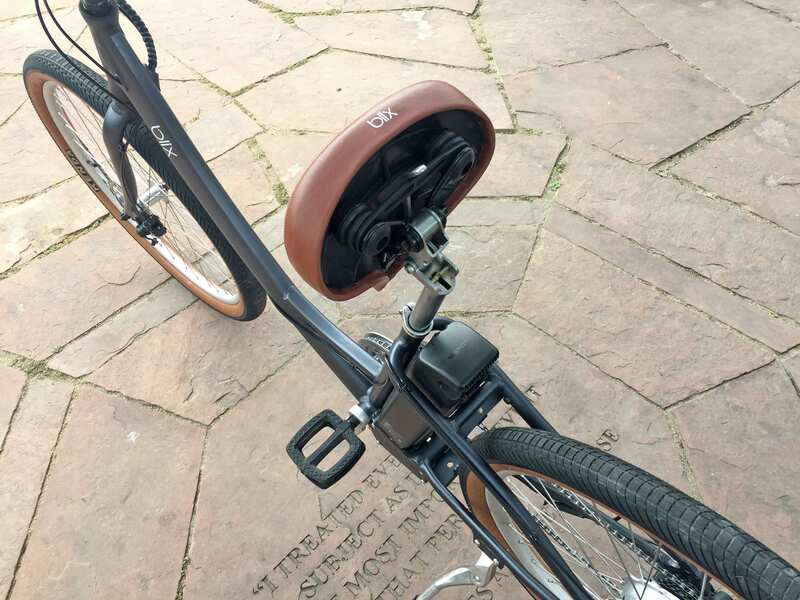 The pack is well-protected in this position if the bike tips or is parked at a crowded bike rack and is easy to slide up and off the frame thanks to a flip-up seat post. 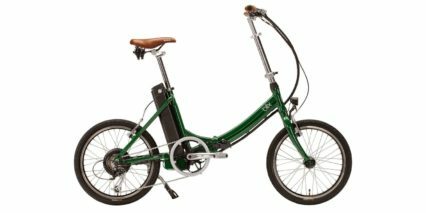 I’ve tested other electric bikes with battery packs that could not be removed without completely raising the seat post or even taking it out of the seat tube… and that can be inconvenient, leaving you guessing about saddle height each time you put the seat post back into the frame. Anyway, that’s not an issue with the Blix Sol and it’s nice to see the little details being managed so well. 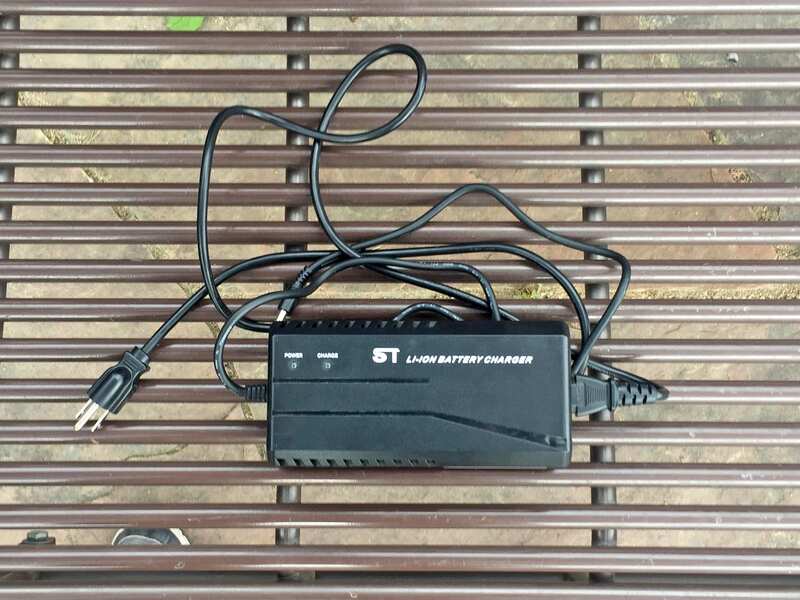 You can charge the battery on or off the frame easily with the included 3-amp charger. 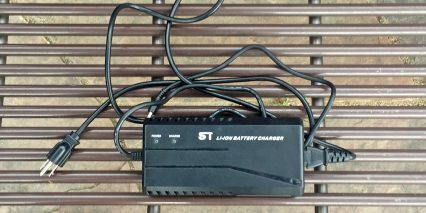 It’s slightly faster than the standard 2-amp chargers I usually see and that makes it perfect for the upgraded 17.5 amp hour battery option. The stock battery is 36 volt 11 amp hour, making it slightly below average in terms of capacity for the 2018 season. 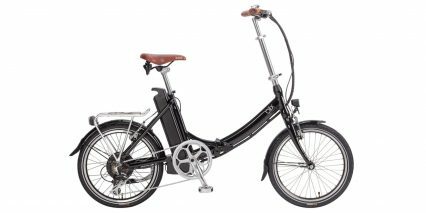 Given the efficiency of the planetary geared hub motor, the stock pack is just fine if you’re an active rider who will use pedal assist most of the time. The larger pack is a great option for heavier riders and those who prefer the highest level of assist and frequent throttle use… given the updated zippy motor controller and less active geometry and saddle on this model, I can imagine a lot of customers making the upgrade since it is so affordable. To really maximize the cycle count of a lithium- ion battery like this, it’s best to store and charge it in a cool, dry location and keep the fill above 20% whenever possible. You can gauge the fill level by pressing the power button on top of the pack and looking at the five-LED readout. Each LED represents a 20% step. 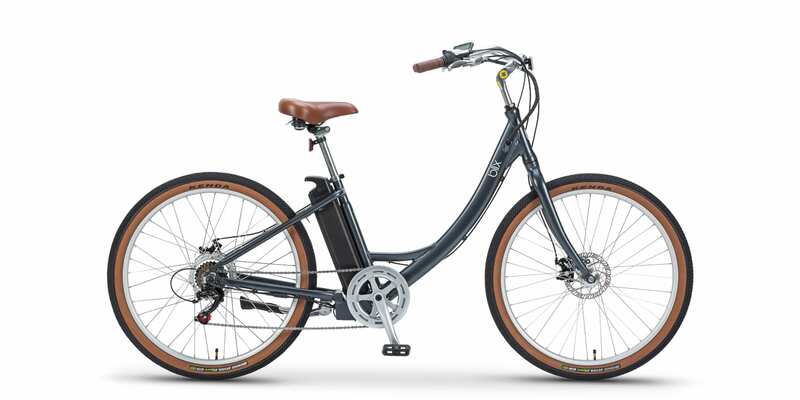 Expect 15 to 35 miles with the 400 watt hour battery, depending on how much you weigh, what the terrain is like, how much you use the throttle, and how full the tire pressure is. 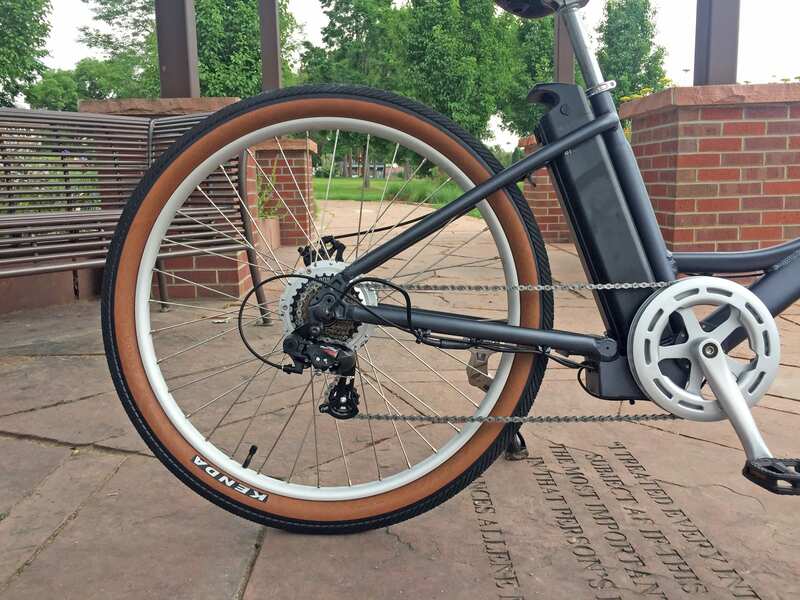 The battery locks into position with a key, but you actually do not have to lock it to ride. This is one point of vulnerability actually, because the key sticks out on the left side of the pack and could get bent by the crank arm or collide with the upper tubing that surrounds and protects the pack. Just be careful when unlocking and removing the battery. You do not need to leave the keys in when riding. 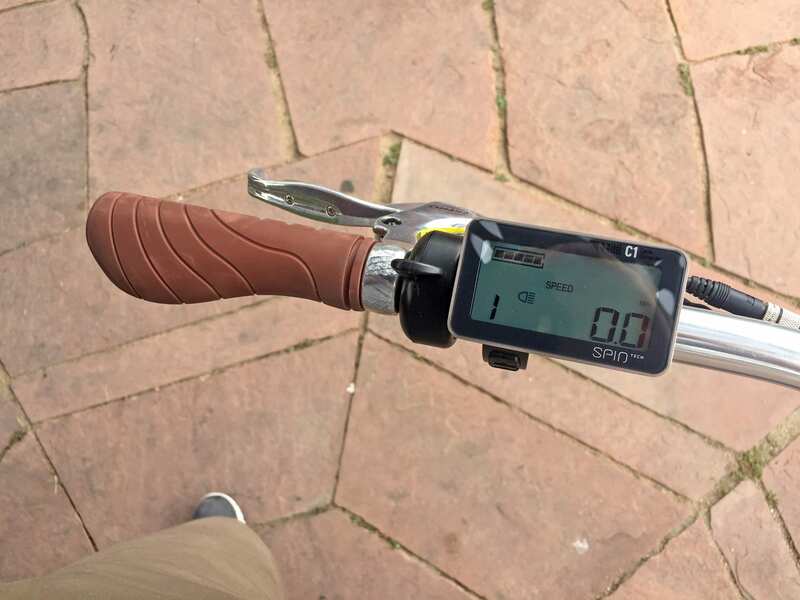 Once you’ve charged the battery, mounted it, and turned it on, you can hold the M button (positioned just above the LCD portion of the display), and the bike will power up. Once you see readouts listed on the display, the throttle becomes active, even in level zero assist. The bike starts in level 1, so pedal assist is also hot. Definitely mount the bike before turning the display on, and turn it off before you dismount. Otherwise, you may bump the throttle and have the bike take off a bit. The trigger throttle is well positioned near the left grip and it offers variable speed output. The up and down arrows on the control pad are a bit difficult to reach because you have to reach over the trigger throttle… but it’s not so bad. I feel like the cockpit is actually very clean and I love the way this display looks. It’s simple to use, arrowing up or down will loop between 0 and level 4, so you don’t have to click as many times as with other control pads I’ve tested. You can hold the up button to activate the LCD backlight and it will also switch on lights if you buy them from Blix and connect to the battery. 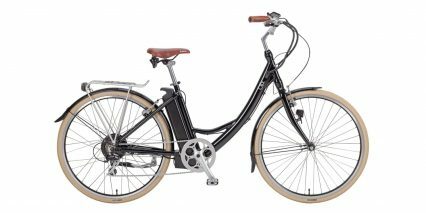 You can see this in action with the Blix Aveny model, which comes stock with both front and rear Spanninga bicycle lights. Finally, you can hold up and down together for a few seconds to enter the display settings. This is where you can clear the trip distance, change the display backlight (nice for reducing distraction if you like night riding), and adjust units from metric to standard. 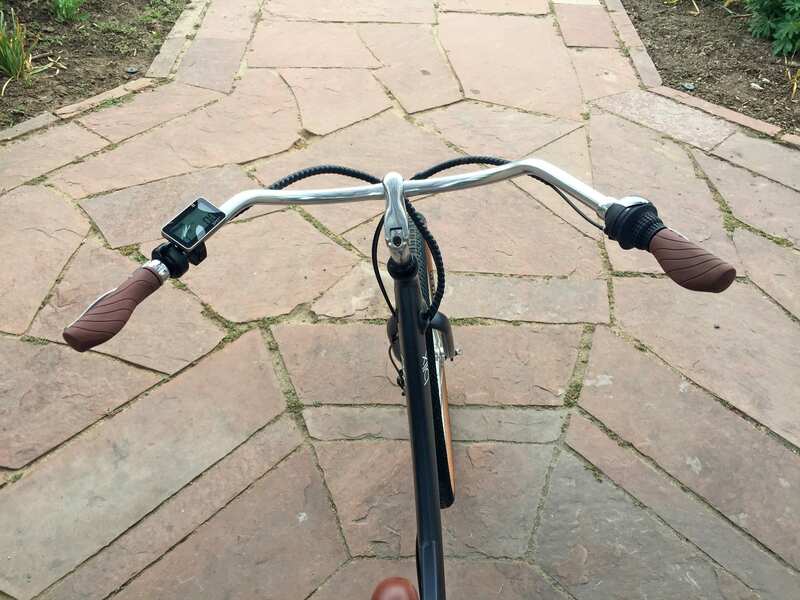 The cockpit is so clean on this bike and I feel that the controls are intuitive and approachable for new cyclists. 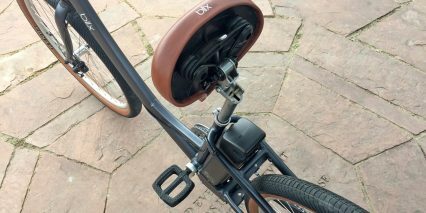 Instead of using trigger shifters, Blix opted for a half-grip twist shifter on the right. It works fine, but isn’t as fast as triggers… and I noticed that the little window on top (which shows your gear level) had to be tipped forward because of the brake lever placement on the demo model. This makes it difficult to read, but most of the time I just feel my way through gears anyway. Both brake levers have a rubberized front edge for comfort as well as motor inhibitors that stop the drive system whenever they are pulled. It’s a great safety upgrade. 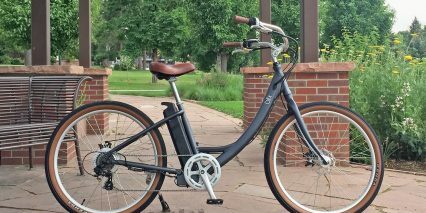 Blix is offering something special with the Sol, an approachable cruiser geometry with efficient drive systems that don’t weigh or cost as much as the competition. 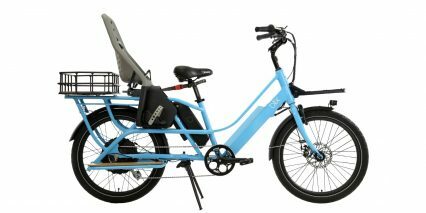 It’s perfect for someone like me who enjoys pedaling, and doesn’t want to deal with an oversized bike due to limited space and limited strength to lift. 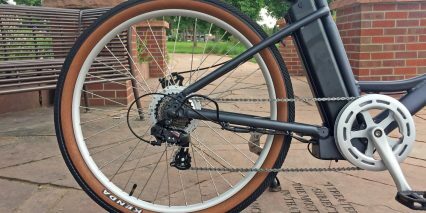 With the battery removed, the bike frame weighs roughly 42 lbs… and the front wheel has quick release for even further weight reduction. I love the pedals they chose because they offer a wider more sturdy platform, but still use rubber tread vs. sharp pins that could scrape your shin or calf. 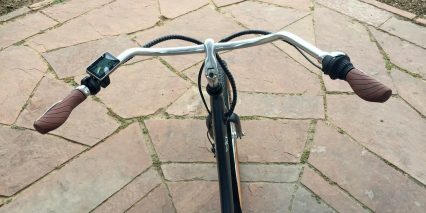 The kickstand is positioned very well on the left chain stay, it doesn’t create pedal lock with the left crank arm. 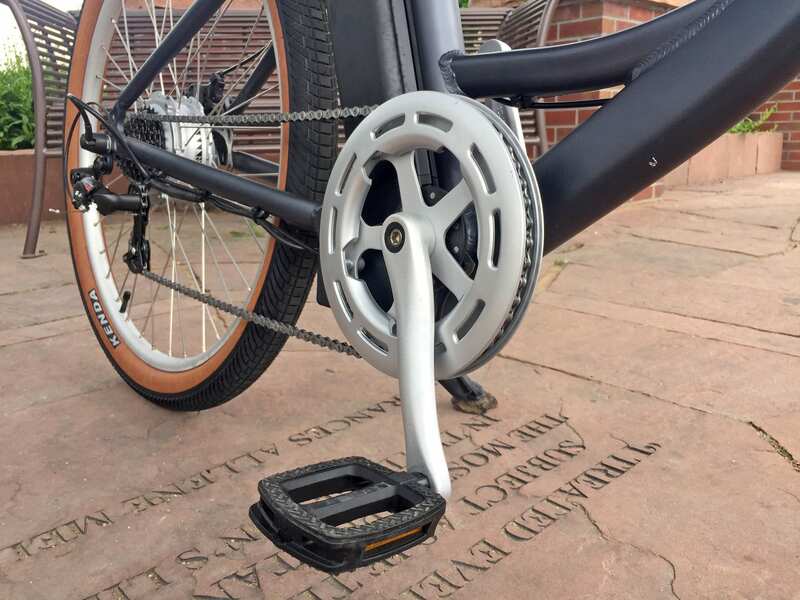 Even though the chain guide is plastic, it should do an excellent job preventing drops and double as a pant or dress protector, keeping you clean and snag-free. Notice where the chainring is positioned relative to the lowest point of the frame. 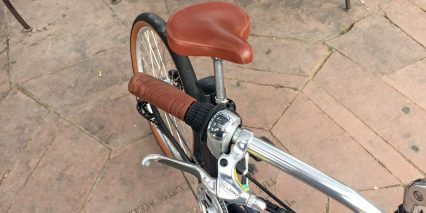 The seat tube is angled back a bit, so riders can achieve good leg extension but also touch the ground when stopping, without getting off of the saddle. 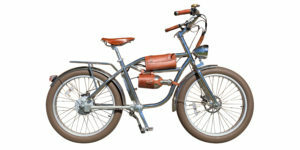 This is a concept I’ve seen with other cruisers like the more expensive Electra Townie Go. 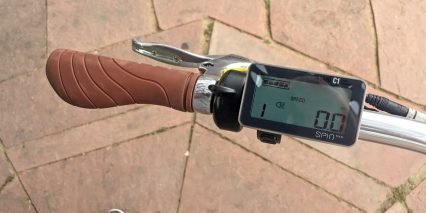 For many riders, it’s nice to have a trigger throttle as well as pedal assist, and Blix went with a fancier 12-magnet sensor to make their products responsive. I was told that they purposefully lengthened the frame to provide stability, slow down the steering, and improve comfort. 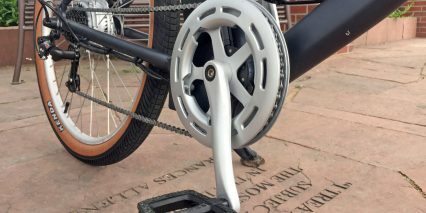 The unique 27.5″ wheel diameter splits the difference between 26″ and 28″ providing a balance of lower frame height against attack angle and air volume. 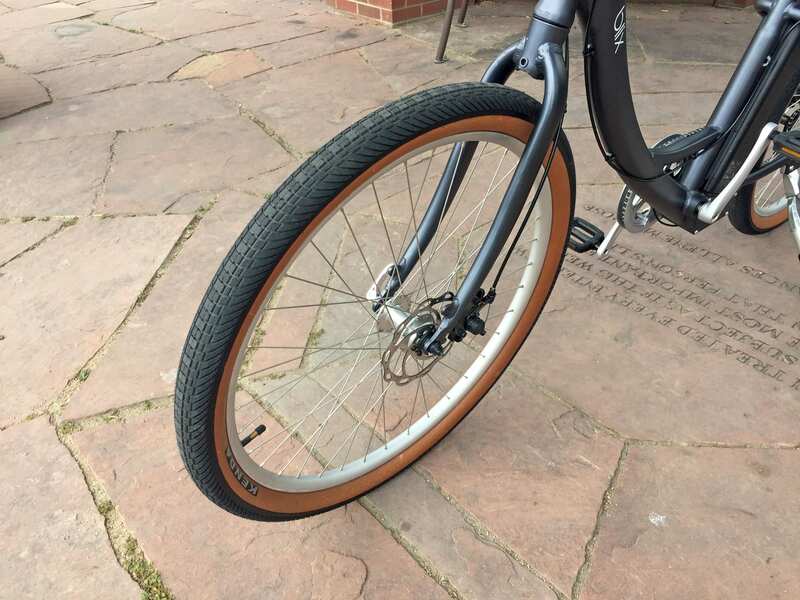 It’s a size that is being uses more frequently on mountain bikes and could make tire replacement limited… I was told that Blix had the Kenda tires custom made with the brown gum sidewalls. They look great, provide K-Shield puncture protection and support a wide range of 30 to 50 PSI tire pressure so you can optimize for comfort or efficiency. 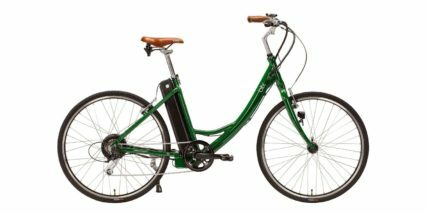 In closing, I like the color choices, appreciate the internally routed cable appearance and nice spiral wrap where they are exposed up front, love that they opted for metal threaded connectors vs. cheap plastic press fit, and am a fan of the disc brakes, even if they are mechanical vs. hydraulic. 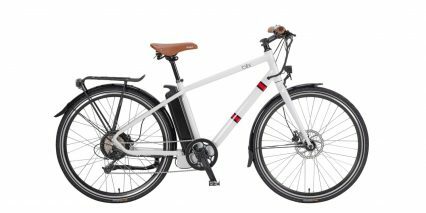 Big thanks to Blix and Best Electric Bikes for partnering with me on this review. 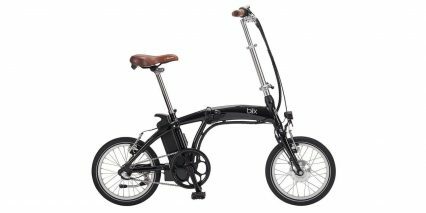 I’ll do my best to answer comments below and invite you to connect in the Blix ebike forums to share your experience or get more feedback from other riders. The display isn’t removable for protection at public bike racks or from inclement weather and it cannot be easily angled to reduce glare while riding, there’s also no USB ports built in for charging which is something I have seen more and more and appreciate for maintaining a smartphone for GPS etc.